This report covers the two week period from 5/10 until 5/22. 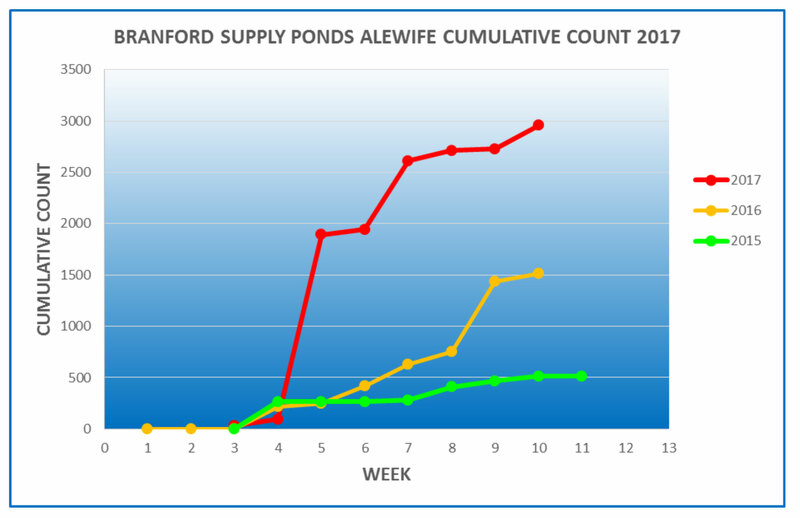 The week ending 5/16 was a very light week – only 13 fish made their way into the Supply Ponds, and it looked like the alewife run might be done for the year. However, the following week saw a respectable surge of 230 fish – our third biggest weekly total so far this year. We are now just shy of 3,000 river herring up the fishway in 2017 – about twice the total for 2016, and almost 6 times more than the 2015 count. The Supply Pond uses an electronic fish counter to keep track of the fish. If you would like to try your hand at counting migrating river herring, go to https://www.mysticherring.org/. The webpage displays video clips of herring going up a Massachusetts fishway on the Mystic River. Click on either the “START COUNTING” or “COUNT FISH” buttons. It’s harder than it you’d think!